Hawk Bird Scarer s can be used to protect rose gardens from bird damage as they scare them away in a harmless manner. Rosella’s in particular descend on rose gardens and destroy them by eating off the flower buds, leaves and water shoots. “My Roses had been pruned very efficiently by Rosella's and Cockie's for three months, until the Hawk Bird Scarer frightened them off,” explains Wendy Burgin of Riverside Drive, Newcastle, NSW. The creator of these revolutionary bird scarers, Trevor Richards, explains that once Rosella’s select a particular feeding site they tend to return to that same location every day until the crop is destroyed. These Australian made bird scarers are the perfect inexpensive, maintenance free solution. They resemble a Goshawk and are comprised of durable plastic. For over twenty years the bird scarers have been protecting crops, gardens and other sites as again and again they successfully scare various species of bird away. Richards goes onto explain that even though they are not real, the bird scarers are nevertheless effective because they make the Rosella's, and any other bird species, think that their natural predator lives in the area where they would like to feed. "Something that looks like it can be enough to keep birds away and prevent them flying into that location,” he explains. The bird scarers can be suspended from a string between taller points around the garden, or alternatively placed on a pole that is then placed in the garden. 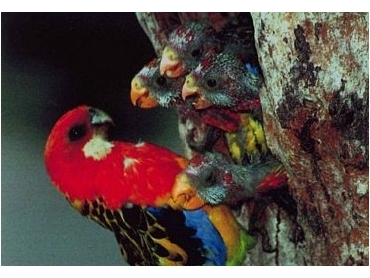 Rosella's can be found in locations across Australia, and they are common in open eucalyptus woodland and farming country. They tend to feed on seeds, grain, blossoms, nectar, fruit and insects, thus while they are a beautiful native bird they can cause extensive damage to various different crops and plants. While hawk bird scarers ensure crops and gardens are protected, at the same time they operate in a manner that ensures no harm is inflicted on the Rosella's, or any other species of bird. We are having trouble with Rosellas attacking our Iceberg Roses, and sounds as though the Hawk Bird Scarer may do the trick. Can you advise how many of these would be needed in our front garden to be successful? Is one enough? 14/11/2012 - One Hawk Bird Scarer would be sufficient to protect the roses in the front yard, but you would need a second one if you had Roses in the back yard.